Sold by HearthSong and Fulfilled by Amazon. Gift-wrap available. Sold by HearthSong and ships from Amazon Fulfillment. 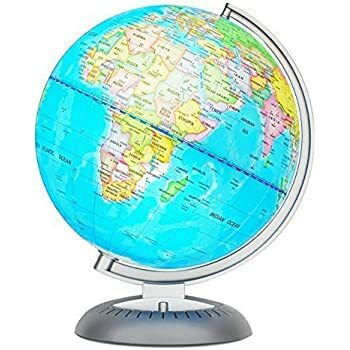 Every household needs a globe, especially one as beneficial, detailed, and versatile as our light-up globe that makes everything so easy-to-see and touch! Whether kids and teens are discovering the mountains of Peru, or the depths of the Arabian Sea, they can relate to global concepts and aid retention through multiple senses—sight and feel. 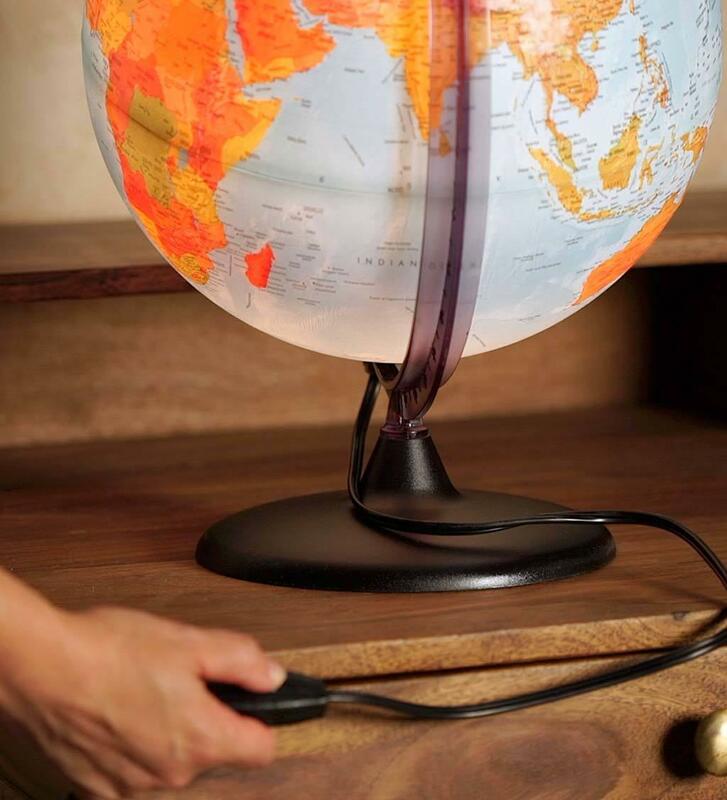 Switch on the soft interior light to reveal a detailed display of Earth's continents and ocean’s topography. 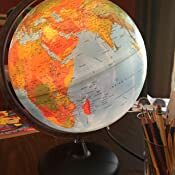 Use our globe as an educational tool, or as a sophisticated decorative addition to your child's bedroom, playroom, or living room. 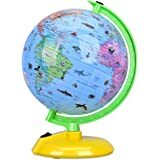 The best all-night companion to keep children feeling safe in the dark, this versatile globe doubles as a nightlight. The light emitted creates a relaxing ambient glow, sure to help calm any nighttime fears. 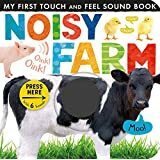 Makes the perfect anytime gift for a budding explorer and the whole family. 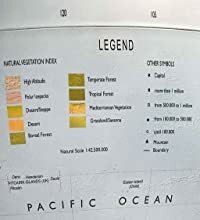 Features clearly labeled continents, oceans, national and political boundaries and capitals, approx. pop., map legend. 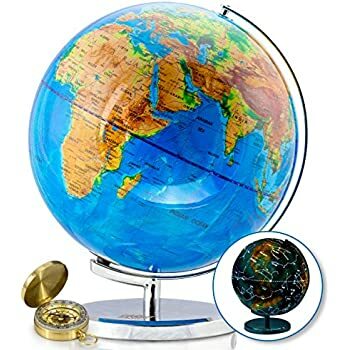 This geographic globe features a calibrated half-meridian, time dial, raised equator; it encourages learning and discovery with kids of all ages. 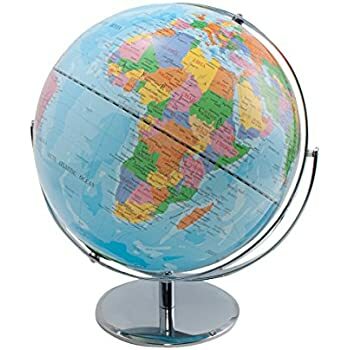 Our inspiring 12-inch globe sits perfectly balanced on any shelf or table—at home or in the classroom. Reveal Earth's geography—mountains, rivers, and underwater ocean topography; Use as a unique night light for a soft, ambient glow in a dark room. HearthSong Exclusive - Every household needs a globe, especially one as detailed and versatile as our light-up globe that makes everything so easy to see—including geography in fascinating relief as well as national and political boundaries (visible when the globe is unlit), calibrated meridian, time dial, raised equator, and sturdy no-tip base. Switch on the soft interior light to reveal Earth's geography, including mountains, rivers, and underwater ocean topography. Makes a fun night-light for the whole family. For all ages. Size: approximately 12" diameter. 3.0 out of 5 starsIs this the reference tool you need? 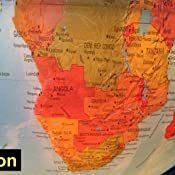 Often when watching TV or reading a news story I am interested in where a city, country, body of water or other geographical feature is located. 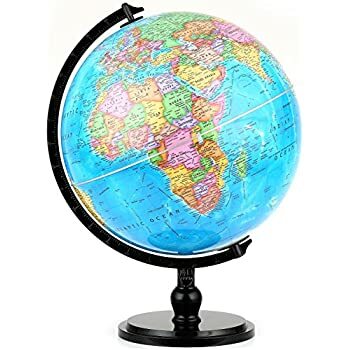 Sure these days I can simply do a search on my smartphone but there is nothing like a globe to put it into context where it is in relationship with the rest of the world. We have a 30 year old illuminated globe made by Scan-Globe A/S in Denmark (Replogle’s European trade name) in our living room that not only serves as a reference tool but as an attractive softly glowing mood light for watching TV. It is beautifully made but the world has changed a lot in 30 years, especially the entire former Soviet Union and much of Africa. So we bought this Orion globe as the most similar in size, design and features to our old one. 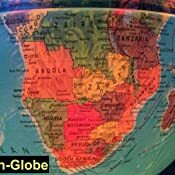 The most obvious is that our original globe is a clear plastic sphere to which has been glued a paper map while the new globe is a plastic sphere that has the map printed directly on to the plastic. I included photos because which is "better" is a matter of opinion. My opinion is that the paper map has sharper text and richer depth of colors. But on the other hand the Orion globe has a 3D raised surface for elevated features like mountains. 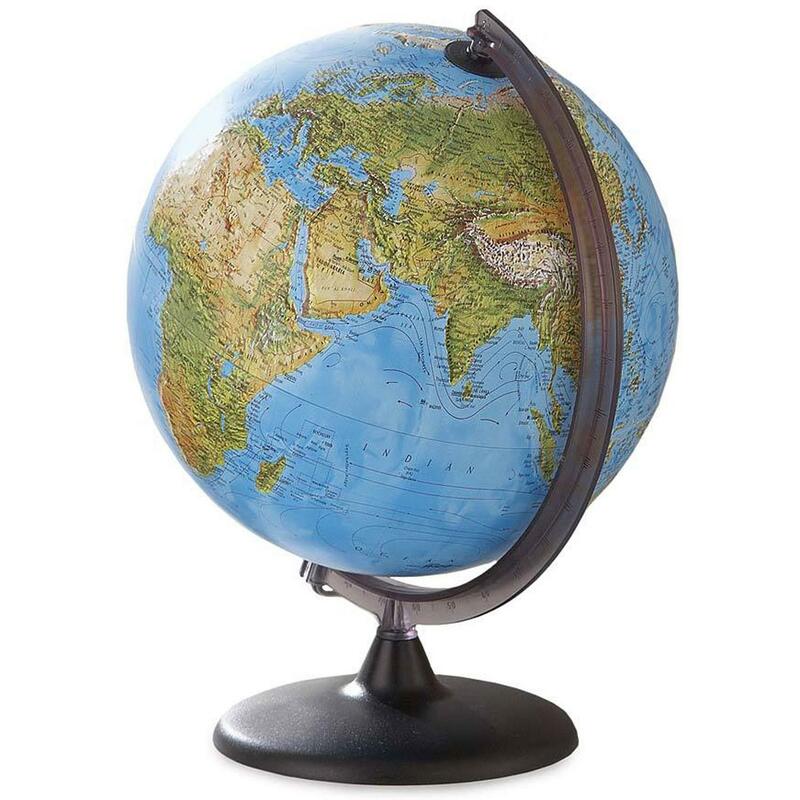 I would not agree with the seller’s description that the globe has a “sturdy no-tip base”. That description leads me to believe the base is weighted, it is not, it is only a thin piece of molded plastic that wouldn’t last long around kids. 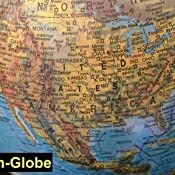 While on the subject of sketchy details, a little research revealed that “Orion” is a trade name for globes sold by Replogle, a highly respected long-time manufacturer of quality globes. 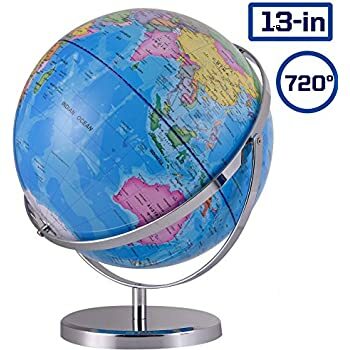 Nowhere on the globe or packaging does it give any indication that this globe is associated with Replogle in any way. In fact the seller’s description states that "this is an exclusive HearthSong product that is only available from them". Hearthsong is an online toy seller. 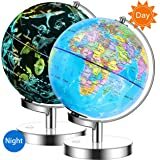 The key difference though boils down to the very reason one buys a globe, which is information and that us where the two globes are night and day. 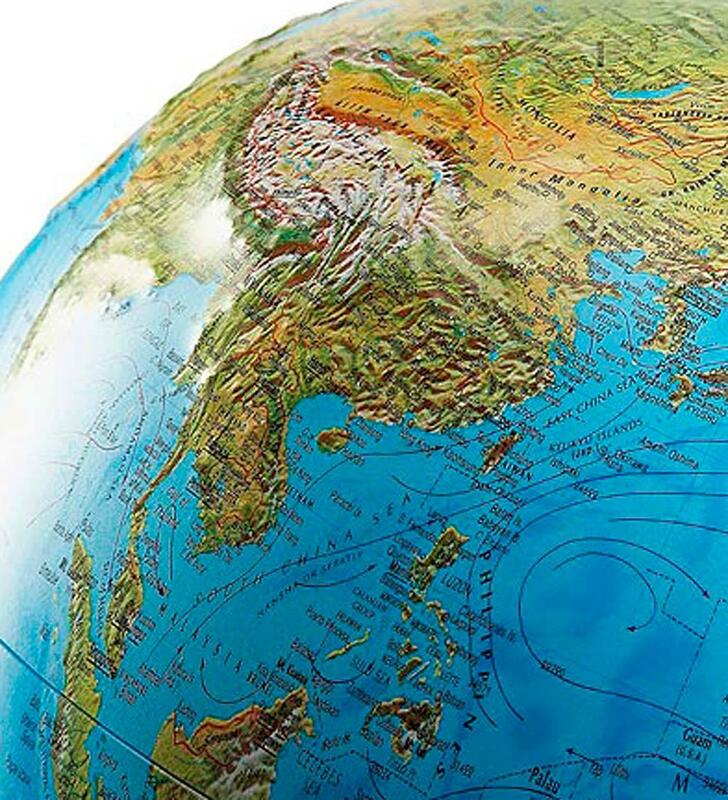 While you can only fit so many city names and other details on to a 12" sphere, the old Scan-Globe wins hands down. I am actually somewhat disappointed at the lack of detail on the Orion globe. I'll grant that at its selling price I didn't expect a classroom quality product but in my judgement the Orion is more of a decorative knickknack than a useful reference tool. Well, this was the first time I have ever returned to Amazon which is pretty good considering how many years I have been a customer. This was a product issue. My globe looked ok even though it seems to be made of low quality plastic. However, when I turned on the light I noticed at once the globe was not put together properly at the equator and light was coming though 1/3 of the equator in some parts by an 1/8in, So the globe looked terrible and was obvioulsly defective once the light was on. Next I will try to spend more for something that is hopefully higher quality. 5.0 out of 5 starsInspire a Love for all Nations! 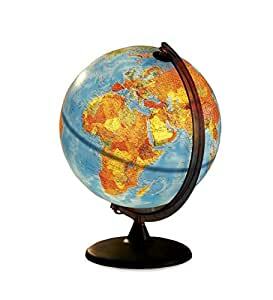 This globe is amazing! 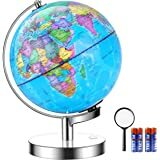 As a homeschooling family, I wanted a nice globe that showed mountainous areas as well as political boundaries. This gives both! My 7 year old daughter has been obsessed with it, looking up every country we come across. It's definitely worth the money! 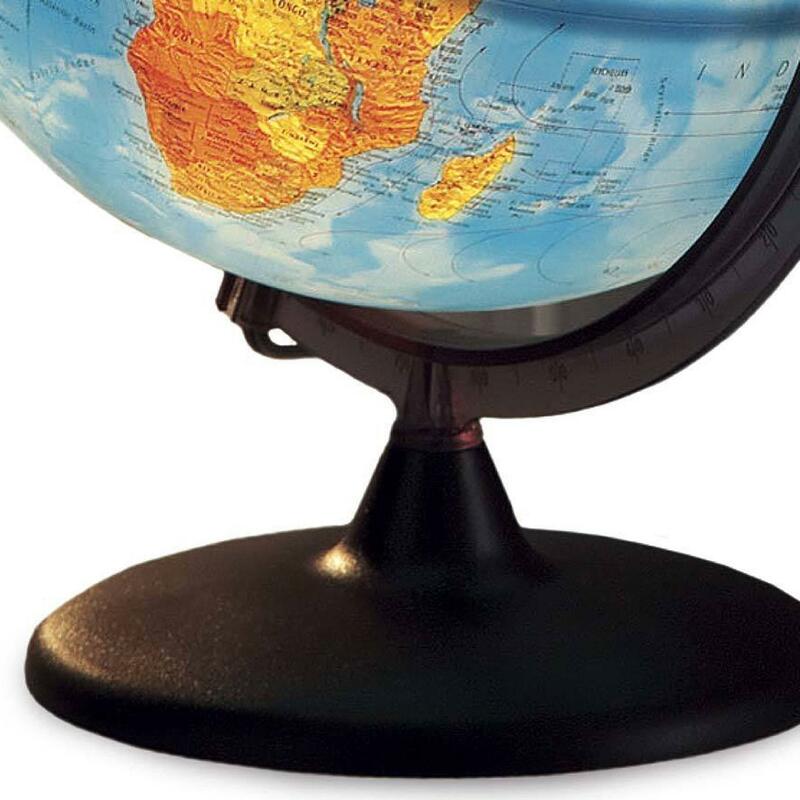 We love this globe. 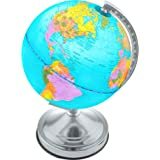 I was looking for an illuminated globe that was colorful enough to be an accent in a child's room, but I also wanted it to be functional for him as he grew older, and had questions about the world. 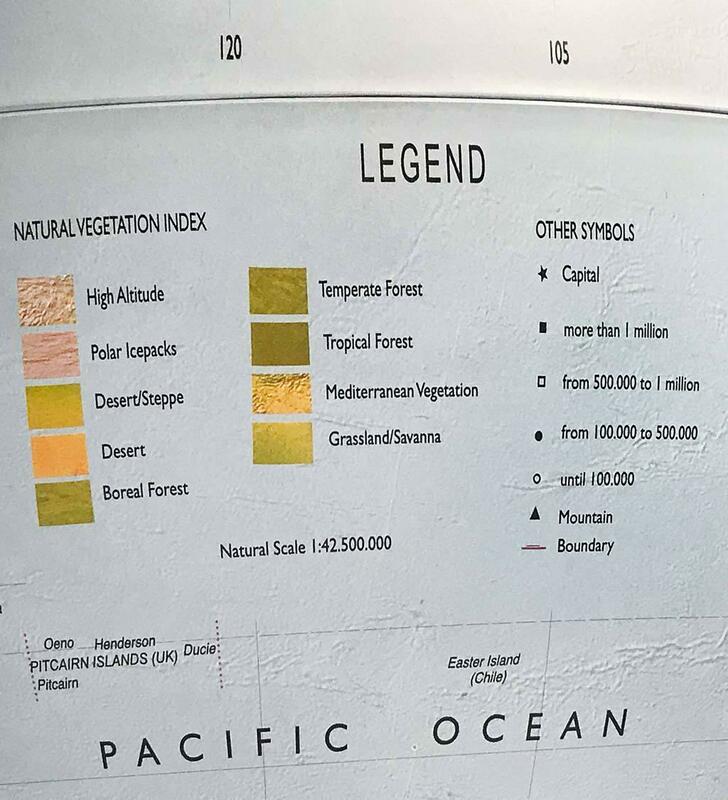 In daylight, it is a Physical map, and shows landscape features in green, brown, and blue. When it is illuminated, you can see the Political map, lit in beautiful warm colors, with all the country names and main cities. The whole thing is plastic, but it is attractive and fairly sturdy. It gives off a pleasant blue light that makes a great nightlight. I have loved having a visual aide to help my child understand where Papa goes on his trips, or where our friends live on the other side of the world. Or what's on the other side of the ocean. It arrived with some nicks in the printed laminate, which I accepted, as it was a birthday present and there was no time to return. (Also, nothing stays pristine when it's given to a small child.) However, it does show when the light is on, so that's why I'm taking off a star. I think I found some appliance bulbs that fit the socket too, but the low wattage ones were too dim, and others were too long, and hard to maneuver back into the globe. The lighted mirror ones were perfect. 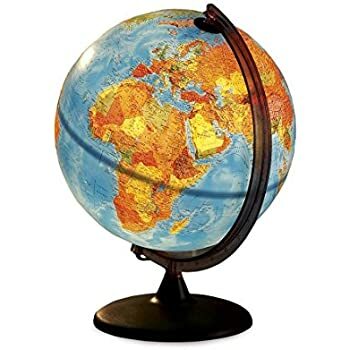 This globe has a cheap, light-weight plastic base and makes a clicking sound when you spin it. Any kid would knock it over easily. I'm returning it because it's definitely not worth the money. Maybe $10, but not $50. We bought this in December and within two weeks of using us (turned on the light for part of the day) the entire globe came a part at the middle seam so that about 1/4 inch of white plastic shows. I don't see a way to fix it so into the trash heap it goes. Very disappointed at what a waste this is. This thing is amazing. 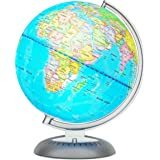 I was looking for a globe that didn't have a cheap feel to it but with a light inside. If you don't want to spend hundreds of dollars that's actually pretty hard. I spent a lot of time looking closely at lots of different models online and ended up purchasing this one and I'm very happy with it. I bought this as a gift but I'm lucky to be able to see it all the time because I'm tempted to buy another one for myself. The light bulb gives off just the right amount of glow. With this as your only light source you can delicately illuminate a room in a beautiful soft light that is good for late nights and early mornings. This is such a good basic staple item for any home, especially homes with children or people who love to travel or for anyone who is curious about Earth and its geography.